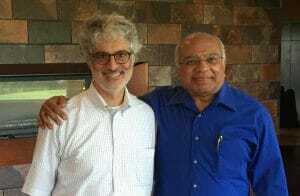 Perhaps you met Srikumar Rao during his visits to Columbus during the past couple years. Perhaps you have heard about his teaching at top business schools around the world. Professor Rao has been the central influence — through encouragement and content — in my teaching of creativity and innovation at Capital University, at Ohio State, and in Vistage meeting rooms throughout North America. He has been a patient tutor and muse. But I’ve never taken his complete three-weekend course on Creativity & Personal Mastery (CPM). I’ve been unable to match his class schedule with my schedule. I’m enrolling in the online version of CPM. If you want to sample it, see the message below for a free first week. I’ve started the first week with every intention of paying the $995 for the rest of the 10-week program. If you want to receive the first free week, send your email address to Janelle Light <Janelle.Light@theraoinstitute.com>. For more details, see below. Would you like to try CPM Online for free? Greetings from the RAO Institute program desk! Hope this email finds you well and enjoying a splendid weekend. We’re so excited to already have delegates from several continents and timezones enrolled in our upcoming online class! This includes: Hawaii, continental US, Canada, Romania, Middle East, Africa, Australia, UK, and Europe. What does the program look and feel like? Of course, the best way to answer that is to show you. So we’ve decided to do just that! For a limited time – the next week or so – we’re giving you a ‘trial’ period on the course. You’ll gain access to Module 1 for free. No strings attached. No fees and no commitment. All we ask is that you do yourself a favor and thoroughly review the materials, practice the tools and make it your goal to really gain from it. Module 1 is the first week of CPM Online, and each week new topics are introduced. If, at the end of your trial of Module 1, you decide you’d like to continue, we’ll enroll you for the whole course. And if you decide it’s not for you, then that’s ok too and we won’t continue reaching out with opportunities to join the program. To get access to Module 1 all I need from you is an email address. You’ll be sent an invite to log into the platform and begin exploring!